In my previous post, I talked about the technologies that transformed buildings in the late 19th and early 20th centuries. Here, we’ll look at the state of today’s facilities and steps building owners and managers can take to drive efficiency at every level of their organization. Insulation: Insulation that has been torn, compressed, retains moisture, is missing or is simply inefficient due to old technology creates a huge opportunity for energy leakage from a building. HVAC: Heating, ventilation and air conditioning use a tremendous amount of electricity and fuel. HVAC and lighting account for 70 percent of the utility bill for most commercial and industrial facilities. Coupling HVAC with automated system controls produces significant efficiencies. Lighting: Old buildings typically use lights that are inefficient and are either on or off based on a traditional light switch. Using occupancy sensor lighting fixtures as well as lighting control programs can significantly reduce commercial lighting costs. Advances in lighting technology can offer energy savings up to 20 percent. Windows: Poorly designed windows leak air and lose energy. They can also create a greenhouse effect that drives up the cost of air conditioning. Replacing windows can increase efficiency up to three times. Chimney: Chimney exhaust contains a lot of wasted heat and moisture. In most old buildings, it simply rises up into the atmosphere and is forgotten. New technology can capture a large percentage of that heat and moisture and recycle it into other uses within the building. Poorly maintained or outdated technologies use a great deal more energy than the newer systems which have steadily improved rates of efficiency. Updating the systems and technology in these areas can significantly improve a building’s efficiency. Not only will it yield significant cost savings, but will also cut back on carbon dioxide emissions. 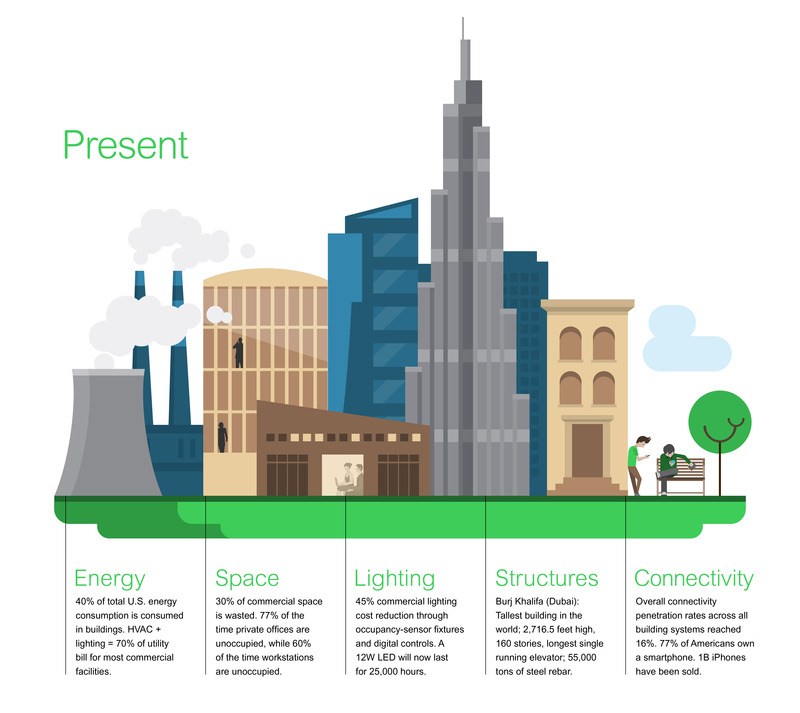 Another key area where buildings are evolving is with integration and connectivity. According to Gartner, smart commercial buildings will be the biggest users of Internet of Things (IoT) technology through 2017, with the installed bases of IoT sensors in commercial buildings growing from 377.3 million in 2015 to well over a billion in 2018. The market for building IoT is forecasted to grow from $46 billion in 2014 to $155 billion in 2020. This new level of connectivity will change the face of buildings of tomorrow. In our next and final post in this series, we’ll take a look at buildings of the future, focusing on how they will use connected technologies to be more energy efficient and space effective. Until then learn more about the systems that will drive the efficient and connected buildings of tomorrow here.